Ok, I admit it: I've been battling the blues lately. It's too hot ... I don't feel very well ... I worry about money all the time ... I hate my condo ... I feel trapped in fat ... I'm undervalued at work ... I'm restless because I alternately miss my closest friends but want to be alone. If you saw me day in/day out, you probably would have no idea I'm struggling. I make superficial conversation, I fuss over those around me. I get my work done on time. I maintain my appointments. But if you read this blog, nothing in the second paragraph is news to you. It's here that I come with my hurts. In a way, you know me more authentically without meeting me than the people I know do. Which is why I'm grateful. For the hits my page gets. I know there are people who visit here regularly and stay for more than a minute or two. You ladies* hear me. Even if I don't know who you are, even if you don't comment, I know from my stats that you've been here and I appreciate it so much. 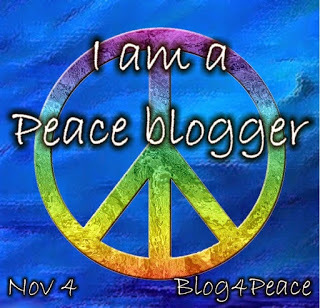 And for two very special blog buddies who responded to two specific posts from Sunday, 5/20. 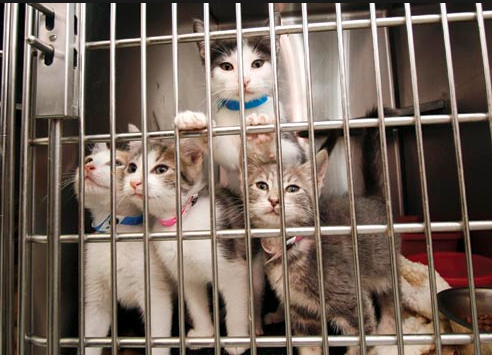 • About the stray cat I saw and was helpless to rescue. Our eyes locked, and I felt she was my responsibility and I let her down. Kwizgiver responded, and made a donation to her local animal shelter on behalf of my Reynaldo and Connie! How generous and thoughtful! It lifted me, assuaged me. • About the book I lost. I got a perfectly perfect hardcover book for Christmas and I saved it for now. 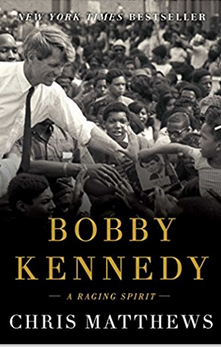 About Bobby Kennedy, I wanted to be reading it when we observe the anniversary of his death. That was important to me. Because I mourn Bobby Kennedy. Because I miss the friend who gave me the book. And then I lost it. Carelessly lost it in a cab or on the train. I was bereft. And then Snarkypants sent me a copy of the book! Anonymously, but I figured it out. So you're getting credit, Snarkela, even if you didn't expect it. Writing is cathartic. Writing is what I do. I'm so fortunate to have people reading and hearing and responding. It means all the world to me. Thank you, thank you, thank you. Thank you, thank you, thank you. *I always assume you're women. In my last post, I said truthfully that there's nowhere I'd rather be than Wrigley Field. But our national past time is not the only intrinsically American thing that's captured my heart. I also love the movies. I ended my long Memorial Day weekend watching a classic with my movie Meetup. 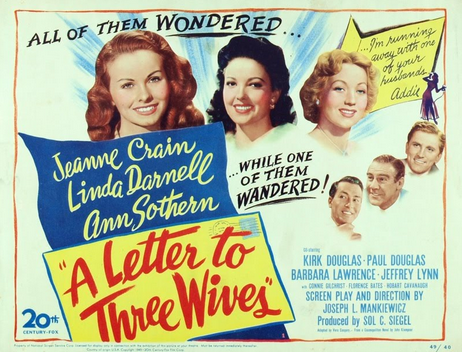 A Letter to Three Wives (1949) is what's known as "a woman's picture." No car chases, no gunfire, no heist. The action all centers on the female protagonists, how they relate to one another, how they feel about their men. It's about Debra, who married a small town scion and wants desperately to fit into his country club world. 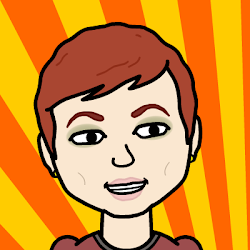 And Rita, who has a pair of twin sons and an English teacher husband whom she loves and so juggles home life and career. And Laura Mae, the girl from the wrong side of the tracks who married her way into money, if not respectability. The girls are all friends, bound by neighborhood and social/charitable commitments. And by Addie Ross. They're all crazy jealous of Addie. Before he went away to war, and met Debra, her husband had been engaged to Addie. Beginning in high school, and continuing throughout their lives, Addie shared a love of music and theater with Rita's husband -- a passion Rita just didn't have time to share. And before he even met Laura Mae, her husband was in awe of Addie, whose "class" he so coveted. One day, as the girls were about to board a boat for an outing with schoolchildren, they received a letter from Addie. She wrote that she wouldn't be able to help with the boatride or picnic because she was leaving town forever ... with one of their husbands. In the days before cell phones, these three are trapped first on a ferry and then on an island, wondering ... wondering .. wondering. Whose husband gave in to temptation and left with Addie? Is A Letter to Three Wives high art? No, of course not. Is it enjoyable? I devoured every minute. And I loved getting my geek on among other classic movie lovers.